An ancient darkness has risen from the ashes . . . and terror has been loosed upon an unsuspecting world. Forensic witch Bianca Sin has never seen anything like it: homeless teenage girls torn to pieces by dark magic in the cold shadows of the city. More terrifying still is the symbol written in blood on an alley wall—the unmistakable seal of the Dark Brethren. Teaming up with NYPD homicide detective Lancelot McManus and an elite task force headed by the shapeshifter Oberon DuPrie, Bianca knows her worst fears have finally come to pass. A new war of annihilation is looming that will plunge the worlds of vampire, shapeshifter, and human into chaos—and two adversarial tribes locked in uneasy truce will need to take up arms together to save the children. Trust will be essential for Sin and McManus, as the hunt forces them to confront their deepest terrors. For the ultimate evil is no longer approaching. As a forensic witch, Sin sees a lot of horrible nasty things, but her latest case may just be the worst. Girls are being torn apart as their unborn children are ripped from their wombs by the darkest magic. They carry the mark of the Dark Brethren, the darkest force imaginable. She partners up with her longtime friend, detective McManus and a special ops task force to get to the bottom of these brutal rituals before the unimaginable happens and the Brethren are released unto this world, wreaking death, horrors, and destruction. Failure is not an option. I really love Sin's character. She's considered the least of her peers as she was never able to bond to a familiar, so she tries to avoid the politics surrounding her kind. (Think high society with magical powers.) In fact, this lack actually lessened the standing of her family, something that is very important in Witch culture. Yet she never once shows an inferiority complex, and she puts her entire heart and soul into her job. I really admire the way she found a way to work with her limited powers to help others. Of course the power situation changes pretty early on in the story as events unfurl. I've always loved books that have an awakening of some sort where the character goes from the weakest to strongest. I think the time spent being "lesser" gives the character a unique perspective and more apt to use the power responsibly when the time comes. Based on what I've seen, no one is more capable and deserving than Sin. I was rather frustrated with the lack of any real romance in Sin's Dark Caress, especially considering the much larger role it played in the previous installments. Sin and McManus had tried the whole intimacy thing in the past and claimed it was incredibly awkward, so they abandoned that idea to just be good friends. Yet, despite that, there still was a spark between them, and I just think there were several missed opportunities for their relationship to have been expanded on. Granted, McManus has had a very rough life, and has good reasons for distrusting Witches as his past haunts him. He has multiple vices of addictions, that are slowly destroying him, so he isn't really in the best of places for a relationship. That being said, the one constant in his life is Sin, and I think in time she could help him overcome his addictions and past. We were given glimpses of that potential with a kiss here and there, but nothing really substantial. Unfortunately, if this series continues the trend of changing character focuses, we won't get to see that growth and change, which is really disappointing. The beginning of Sin's Dark Caress was rather slow, but once things got in motion, they took off with a bang, almost, but not quite to the point of chaos. I would have preferred a more even pacing, but that didn't hinder my reading experience as much as my frustration with the lack of romantic development. Honestly, I don't mind a slow romantic build up when the series continues with the same characters, but as we probably won't directly see these two together I feel rather let down. That being said, the rest of Sin's Dark Caress was pretty solid, and definitely worth the time spent. 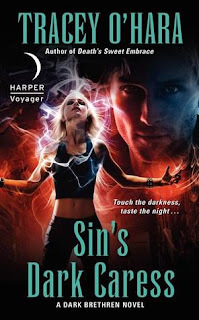 So if you enjoy Urban Fantasy and don't mind the lack of romance, then Sin's Dark Caress should largely appeal to you.